The global 3D Printing in Healthcare market was valued at $797.7 million in 2017 and is estimated to grow at a CAGR of 18.3% throughout the forecast period (2018-2023). North America is the leading market in the 3D Printing in Healthcare Market with 39.7% of the total share and it is followed by Europe. 3D Printing in Healthcare Market in the Asia Pacific region is growing at a significant pace and the share of Europe and the APAC combined was 37% of the global market. Plastic materials used in 3D printing in healthcare are projected to grow at an impressive rate, it is expected that the total plastics shipped for medical printing purposes would be over 570 tons in 2020. In the technology used, Laminated Object Manufacturing technology is expected to grow to $372.8 million by 2023 at a CAGR of 15.5%. Stereo Lithography Technology is estimated to grow with the highest CAGR of 31.7% to reach $165.8 million by 2023. 3D Printing in Healthcare is of many types like Selective Laser Sintering (SLS), Thermal Inkjet Printing (TIJ), Fused Deposition Modeling (FDM), Stereo Lithography (SLA), Binder Jetting (BJ), Material Jetting and others. These use different technologies for 3D printing which include Laser Beam Melting (LBM), Electron Beam Melting (EBM), Photo Polymerization, Droplet Deposition, Laminated Object Manufacturing, Wax Deposition Modeling and Bio Printing. The applications of 3D printers in healthcare include medical uses such as organ fabrication, anatomical models, and the creation of customized prosthetics, drugs and tablets and many more. The end users include Prosthetics, Medical Components, Tissue Engineering, Hearing Aids, Surgical Guides, Dental Implants, Drug Screening and many more. 3D printing has been used by the manufacturing industry for decades to produce product prototypes. Many manufacturers use large, fast 3D printers called rapid prototyping machines to create models and molds. 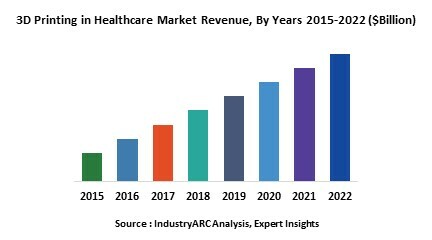 3D Printing in Healthcare Market report comprises of pricing analysis for different types of 3D printing in healthcare. The average prices of 3D printers used in healthcare will range from $60,000 to $80,000 by 2020. 3D Printing in Healthcare Market Growth Drivers: One of the main drivers in the global 3D Printing in Healthcare Market is the growing use of this technology in many applications like transplantation, drug delivery, 3D printed organs and many others in the healthcare industry. Rising demand for implant customizations during surgical procedures coupled with growing R&D investments is also driving the global 3D Printing in healthcare market. 3D Printing in Healthcare Market Challenges: One of the major challenges in the global 3D Printing in Healthcare Market is the high cost of 3D printers. Technologies like stereolithography, laser beam, electron beam, photopolymerization and droplet deposition techniques are way too costly. The base year of the study is 2017, with forecast done up to 2023. The study presents a thorough analysis of the competitive landscape, taking into account the market shares of the leading companies. It also provides information on unit shipments. These provide the key market participants with the necessary business intelligence and help them understand the future of the 3D Printing in Healthcare market. The assessment includes the forecast, an overview of the competitive structure, the market shares of the competitors, as well as the market trends, market demands, market drivers, market challenges, and product analysis. The market drivers and restraints have been assessed to fathom their impact over the forecast period. This report further identifies the key opportunities for growth while also detailing the key challenges and possible threats. The key areas of focus include the types of 3D Printing in the Healthcare market and their specific applications in different types of vehicles. 3D Printing in Healthcare Market Technologies: Laser Beam Melting (LBM), Electron Beam Melting (EBM), Photo Polymerization, Droplet Deposition, Laminated Object Manufacturing, Wax Deposition Modeling and Bio Printing. Materials in 3D printing in Healthcare: Donor Cells, Plastics, Photopolymers, Metals, Ceramics, Bone Cement, Polylactic Acid (PLA) and Others. 3D Printing in Healthcare, Types: Selective Laser Sintering (SLS), Thermal Inkjet Printing (TIJ), Fused Deposition Modeling (FDM), Stereo Lithography (SLA), Binder Jetting (BJ) and Material Jetting. Some of the key players mentioned in this report are Javelin Technologies, Hewlett Packard, Medical Molding Inc, Proto Labs, 3D Systems, Stratasys, SLM Solutions Group, Nano Dimension, ExOne, Organovo and Voxeljet among others. On February 2018, Johnson&Johnson’s has announced the launch of a Global Centre of Excellence for 3D bioprinting at the Trinity College Dublin, Ireland. This new facility which is a collaboration between Johnson & Jonhson's and AMBER research will serve as a 3D bioprinting research laboratory. It is expected to be operational before the beginning of 2019, the facility will also conduct research in the field of orthopaedics and is expected to transform the delivery of healthcare services for patients and consumers. Engineers from Pohang University of Science and Technology, South Korea have successfully developed “bio-blood-vessels” from a 3D printer using material extracted from the human body as a template. These blood vessels are also capable of acting as drug carriers that will release the drug into its inserted surroundings thereby increasing the likelihood of a successful implant. Spanish Scientists from the Universidad Carlos III de Madrid, Spain, Center for Energy, Environmental and Technological Research (CIEMAT), Hospital General Universitario Gregorio Marañón, in collaboration with the firm BioDan Group, Spain, have presented a prototype for a 3D bioprinter that can create totally functional human skin. This skin is adequate for transplanting to patients or for use in research or the testing of cosmetic, chemical, and pharmaceutical products. In August 2016, the FDA approved an epilepsy drug called Spritam that is made by 3D printers. It prints out the powdered drug layer by layer to make it dissolve faster than average pills. It is reported that scientists from University College of London have discovered a new way of printing drugs for children. The scientists are designing pills in the shape of octopuses, dinosaurs or cartoon characters so that it will be easier for kids to take pills.